sale, Rising Sun was back at her native shipyard for refit, at the Lürssen yard in Bremen where she was launched in 2005. As usual with this German yard, no details were released, but we can already spot some modifications from outside. First Rising Sun has had a full paint job. There is now a new colour scheme for the technical area around the mast and the various domes, all painted in the same metallic grey as the mast. Another main point is the aft deck. The roof above the main deck was lengthened to follow the same design as the two other upper aft decks. No more basketball games are possible now. Note also that the name Rising Sun is removed from the hull. 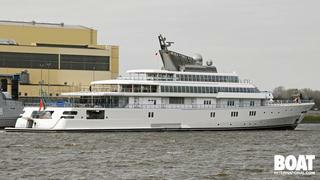 Maybe the yacht will be renamed before the end of this refit, scheduled for very soon.